I was first introduced to Rituals, a spa brand from The Netherlands, while working in the Marie Claire beauty closet. MC works on tons of international stories, and the best products from around the globe are often spotlighted. While these stories are always fun to read, they’re really tricky to work on. Some brands are impossible to get in touch with, international shipments can take weeks, and deadlines are super short! 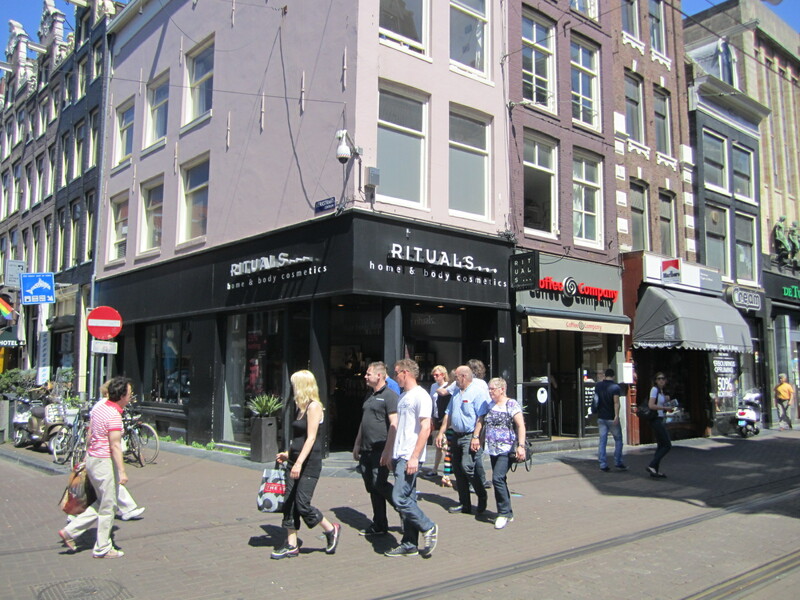 It was so … relaxing… to arrive in Amsterdam and pick up whatever I wanted right in the Rituals store. Read on to see what I think of my picks and to see the stores I visited! Qi Gong Organic White Lotus and Yi Yi Ren Anti-Perspirant Spray: Okay, so I’ve already told you what I think about aerosol deodorants. I don’t trust them as actual sweat-preventing products, and I’m nervous to so much as try them out on my heavy-activity days. So far, I’ve only sprayed this one on for days that I’m lounging at home. I love the fresh smell and it seems to do it’s job in terms of odor-blocking, but I’m not sure if it helps prevent sweating at all. Hammam Delight Fresh Eucalyptus and Rosemary Foaming Shower Gel Sensation: Hammam is officially my favorite scent that Rituals offers. And the coolest thing about this particular shower gel is that it sprays out like shaving gel: it starts out as a gel and foams up when you use it. Definitely a fun treat to spice up your boring shower routine. Wai Wang Organic White Lotus and Yi Yi Ren Exfoliating Body Scrub: The scent is really mild and the scrub salt granules are really tiny, so you don’t feel like you’re rubbing sharp, smelly rocks on yourself. (If you’ve tried a crappy exfoliator, you know what I mean.) I love using scrubs like this on my legs before I apply lotion or self-tanner, so that the product can really seep in and not just lay on top of dry, dead skin. 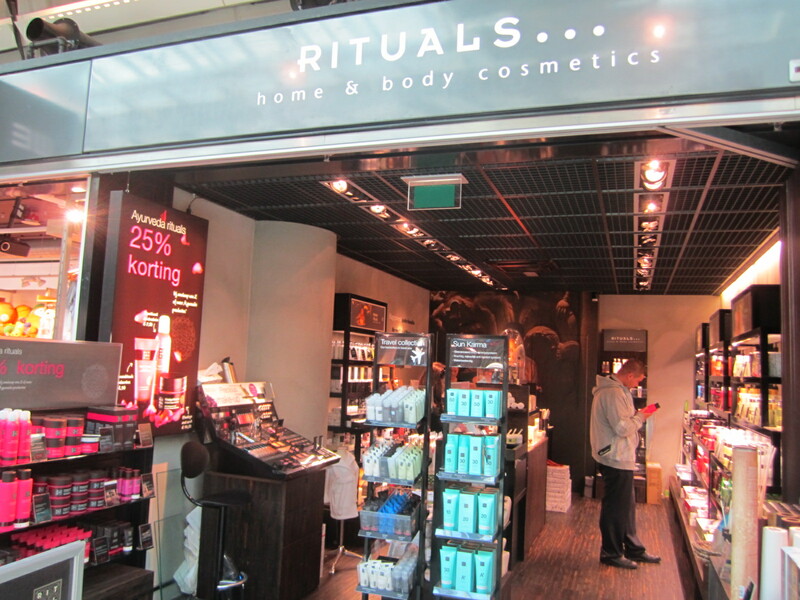 This is the Rituals boutique in the actual Amsterdam airport. Have you ever seen such a lovely, fully set up spa in the arrivals hall of another airport? I know I haven’t! This was my first intro into actually trying out their shower gels, and it instantly converted me to a brand fanatic. This store had a great cosmetics setup as well (center left), so it was fun to try out the colors. 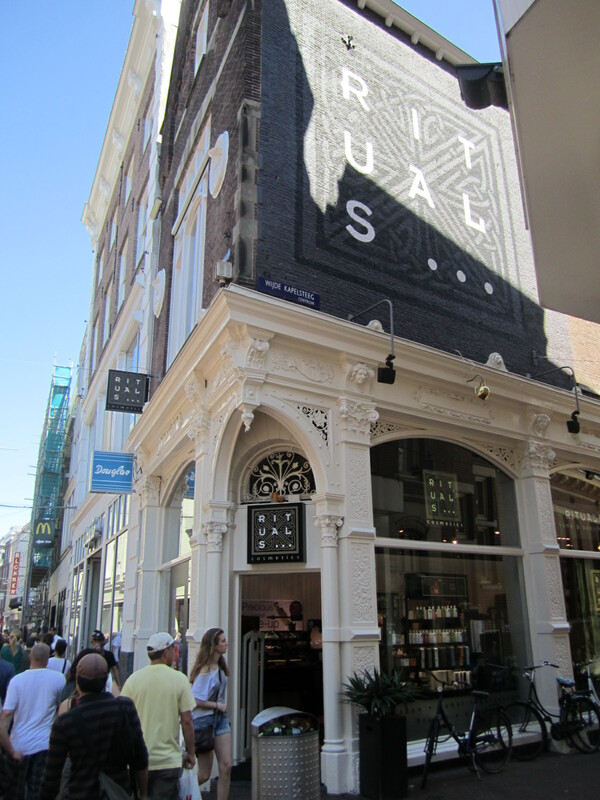 This is the most gorgeous Rituals storefront that I encountered in Amsterdam. Don’t the artistic architectural details beckon you in to try all the products? I feel like I probably would have taken a picture of this store on my city tour even if I wasn’t actively scoping out Rituals boutiques, because it’s just that picturesque. The final Rituals location I stopped at was probably the most underwhelming. I guess the other two stores just impressed me too quickly. The same great products were housed inside this shop, so it wasn’t a bad experience. But it just goes as a little proof of marketing that shopping experiences are most enjoyable when you’re surrounded by lovely decor. You can order any of these products online or make a few pit stops if you’re ever in Amsterdam! Whether digital or in your travels, make sure to check out all the collections and let us know what you think. Is the rituals store accessible if I am connecting to another international flight.I will not be leaving the airport .